Home > Articles > Chris Cornell, Soundgarden & Audioslave Frontman, Dead at 52. 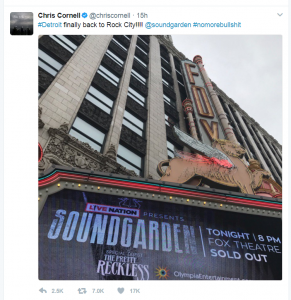 Chris Cornell, lead singer of Soundgarden and Audioslave is dead after performing in Detroit Wednesday night. Director of media relations for the Detroit Police, Michael Woody, stated that a family friend called 911 around midnight after he went to check on Cornell and found the musician “unresponsive” on the bathroom floor at the MGM Grand hotel. EMS personnel arrived, and Cornell was pronounced dead at the scene. 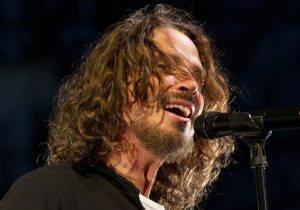 Cornell mentions on the Audioslave – Live in Cuba DVD documentary that he spent a two-year period between the ages of nine and eleven solidly listening to The Beatles after finding a large collection of Beatles records abandoned in the basement of a house. He then suffered from a severe case of clinical depression during his teenage years, rarely leaving the house. At one point, he spent a whole year of his life without leaving his house, during which time he would spend his time drinking and playing drums and guitar. Before becoming a successful musician, he worked at a seafood wholesaler and was a sous chef at a restaurant named Ray’s Boathouse. He is survived by his second wife, Vicky Karayiannis, and three children, Lillian Jean, Toni and Christopher Nicholas. We wish his family, friends, and fans our deepest sympathies.